For most people, the holiday season is filled with tradition. Whether it’s chopping down a real Christmas tree, going carolling, or feasting on a delicious turkey dinner, families all over the world look forward to the comfort and joy of their holiday traditions. 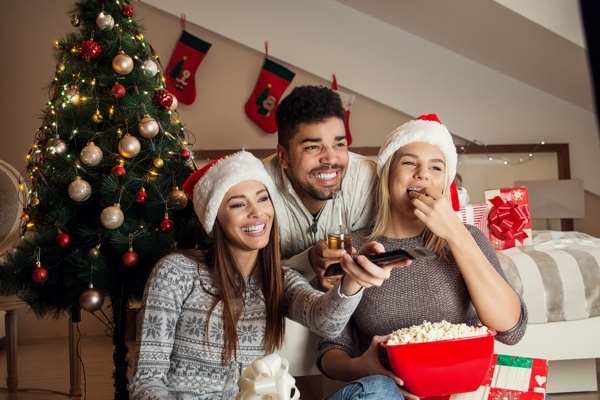 Many family holiday traditions include one or more Christmas movies. At the very least, if your family isn’t big on movies, you’ll catch Home Alone one out of the 500 times it airs on national TV in a primetime spot. There’s no escaping Kevin McCallister at Christmas-time. I’m particularly fond of A Charlie Brown Christmas, Christmas Vacation and A Christmas Story, mainly because those are the movies I grew up watching around the holidays. There truly is no substitute for nostalgia; when I watch one of my family’s favourite holiday films, I’m transported instantly back to my childhood – and what a wonder that is in today’s fast-paced world. Wherever you are and whatever your traditions, do yourself a favor and let nostalgia take the reigns for just a moment this holiday season. With all those feels aside, I was recently thinking we needed to publish a holiday-themed post, but couldn’t get beyond the familiar retreads you see popping up this time of year. Then it struck me: instead of doing an off-topic post about Christmas or a millionth post about how to reach your customers during the holidays, why not try to learn a thing or two? The process of finding marketing lessons businesses can learn from holiday movies certainly opened my eyes to a few things, so I hope it’s just as helpful to your business as you celebrate the holidays and move into 2017. Did you really think I would to start the list off with anybody other than the bravest and most resourceful kid the 1990s ever knew? Wouldn’t dream of it! Think about it though: Kevin McCallister is a master planner, and it’s his meticulously planned home defense strategy that saves his life and protects his family’s home (it has nothing to do with the IQ of the Wet Bandits!). Whether we’re talking about the paint buckets, the blowtorch contraption or a hot iron to the face, Kevin’s strategy trumps the Wet Bandits’ lack of planning at every turn. It was, and still is, a pleasure to watch the eight-year old’s perfectly laid plans come to fruition. The marketing lesson here is to be like Kevin McCallister, not the Wet Bandits (who wants to be like the Wet Bandits, anyway?). Whether it’s a small strategy or a full marketing automation campaign, a plan of action will go a long way to ensuring your success – and protecting your house! Ah, good ol’ Sparky, such a classically lovable and goofy Christmas character. Clark wants to deliver the perfect Christmas to every person in his family and he works so hard to make it happen. Unfortunately, a severely underwhelming Christmas bonus, a dried out turkey, a rogue squirrel and his Cousin Eddie’s existence undo all the time and effort Clark puts into the family’s holiday. Clark tries to do everything you can possibly do at Christmas-time, from cutting down a giant tree to having the most impressively decorated house to spending too much on a giant present for his family. It’s easy to see that in an effort to make Christmas perfect, Clark spreads himself way too thin and almost ruins everything. In the business world, by all means, emulate Clark’s enthusiasm for creating something memorable. But don’t spread too thin by trying to engage with every marketing tactic available to you. If you have a small team, or a low budget, it’s much more productive to do one or two things really well than try to do it all and fail miserably. Sometimes, less – done well – is actually more. No, the lesson we can learn from Ralphie Parker and A Christmas Story is not, “You’ll shoot your eye out!” Nor is it the hazards of sticking your tongue to frozen flagpole, although that can and does happen so, you know, don’t do it. Look, it’s 2017. Consumers are smart and they don’t appreciate obvious and obnoxious marketing ploys. By all means, create engaging content, be social, and connect to your customers by email – just do it in such a way that doesn’t disrupt them and, hopefully, offers them value. There are a great many lessons in Charles Dickens’ classic work, A Christmas Carol. The story itself is a series of lessons taught to, and eventually learned by, one Ebenezer Scrooge. The lesson I find applies very much to both business and life is Scrooge’s failure to realize happiness is a kind of currency. The fact that Scrooge cares only about money and shuns everything else in life, including and especially Christmas, is the focal point of any mention of A Christmas Carol. But it’s Scrooge’s loss of the ability to see happiness as a currency that is the catalyst to his miserable life. The scene marketers can learn from is one in which The Ghost of Christmas Past takes Ebenezer back to a Christmas party held by his jovial and festive boss, Mr. Fezziwig. Old Scrooge watches Young Scrooge enjoy himself at the party, even dancing with Belle, the woman he gets engaged to but never marries. Old Scrooge, watching his younger self in a truly happy state, comments on the kind-hearted nature of Mr. Fezziwig in a seemingly positive manner – a stark contrast to his own nature. The main lesson to learn from Ebenezer Scrooge is one we’ve talked about before: the domino effect of a great customer experience. In order to keep its brand promise and deliver a great experience, a business must treat its employees they way it wants its employees to treat customers. And the main currency that drives and balances this customer experience equation? You guessed it: happiness. On behalf of Kevin McCallister, Clark W. Griswold Jr., Ralphie Parker and Ebenezer Scrooge, we hope you enjoy your holiday movie traditions with their usual nostalgia, but also an open mind for learning a marketing lesson or two from these classic holiday characters. Happy holidays and best of luck in 2017 and beyond!